I heard about CrossFit through one of my cousins who lives in Boston. She was taking some classes. She was in love with it and had only good things to say about the results and motivational attitude of her coaches. However, I was going through depression at the time and during therapist sessions, it was recommended for me to find a hobby. So, I decided to Google a CrossFit location near home and sign up for a trial class. I fell in love and never stopped since then. Its very different from a regular gym, the atmosphere is very high energy “up!” The coaches’ knowledge and patience to always push you to do better is the biggest differential and motivation. Also the people you work out with become friends and are always pushing for everyone to do better, everyone is pushing each other to always grow on your skills. I recommend them to be patient, because it’s a process. In the beginning you feel like you will never be able to complete a WOD. However, with time and persistence you will get better on the exercises. Trust yourself; trust your coach and always give 100% of yourself and results will come. I have a few that I enjoy but the most recent was the Tabata WOD. FRAN is my least favorite WOD. The Butterfly Sit-up is my favorite. The Pull-up is my least favorite. 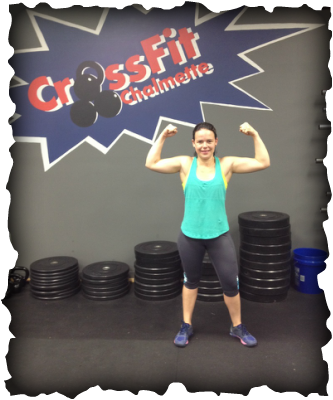 Great job, Bia, on your selection as the CrossFit Chalmette Featured Athlete for Winter 2016! You are a true inspiration to us all at the box! You have made tremendous gains toward your fitness goals since joining the CrossFit Chalmette family. Look what you did in seven months!!! Continue to push yourself like you do at every class. You make coaching early in the morning easy!